The main façade of the palace in mid-2009. Paço de São Cristóvão (Portuguese pronunciation: [ˈpasu dʒi sɐ̃w kɾiʃˈtɔvɐ̃w], English: Saint Christopher's Palace; also known as Palácio Imperial or Palácio de São Cristóvão) is a palace located in the Quinta da Boa Vista park in Rio de Janeiro, Brazil. It is the former residence of the Emperors of Brazil. It currently houses the National Museum of Brazil. 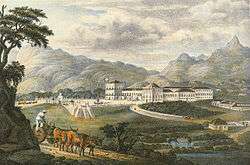 View of the Quinta da Boa Vista with the Paço de São Cristóvão in the early 19th century, before the Neoclassical intervention. 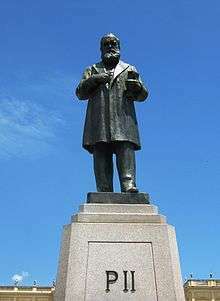 Statue of Emperor Pedro II in front of the palace. 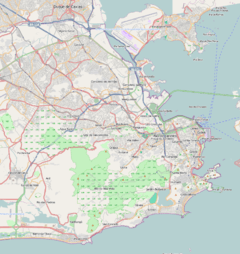 In the early 19th century, the area known as Quinta da Boa Vista (Good View Estate) belonged to Elias Antun Lubos, Elias António Lopes in portuguese, a rich Lebanese merchant, who in 1803 built a manor house on top of a hill. 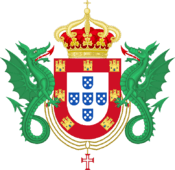 When the Portuguese court was transferred to Brazil, in 1808, Elias António Lopes donated his farm to the Prince Regent John VI. John VI appreciated the gift and stayed for long periods in the manor house. The Portuguese Royal Family had been living in the Paço Imperial since their arrival in Rio de Janeiro in 1808. 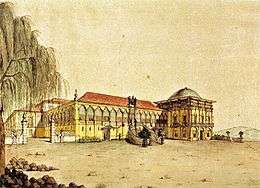 To better accommodate the royal family, in 1819 John VI had the manor house of the Quinta da Boa Vista renovated, transforming it into a royal palace. The renovation was directed by English architect John Johnston and was completed in 1821. In front of the palace, Johnston installed a decorative portico, a gift sent from England to Brazil by Hugh Percy, 2nd Duke of Northumberland. After the declaration of Independence of Brazil, in 1822, the palace became the residence of Emperor Pedro I. The remodelling and expansion of the palace continued under Portuguese architect Manuel da Costa (1822–1826), followed by French architect Pedro José Pezerát (1826–1831), credited as the author of the definitive Neoclassical project of the building. He added a new tower to the left of the main façade and added a third floor to the palace. The works were continued after 1847 by Brazilian artist Manuel de Araújo Porto-alegre, who harmonised the style of the façades, followed by the German Theodore Marx (1857–1868). Italian painter Mario Bragaldi decorated many of the rooms of the palace, including the Throne Room and the Ambassadors' Room, with paintings in trompe-l'œil. After the marriage of Pedro I and Princess Maria Leopoldina of Austria, in 1817, the Imperial couple resided in the palace. Here were born the future Queen of Portugal, Maria II, as well as the future Emperor of Brazil Pedro II. Empress Maria Leopoldina died in the palace in 1826. Pedro II, future Emperor, grew up and was educated in the palace, and in 1869 ordered the remodelling of the gardens. French garden designer Auguste François Marie Glaziou was put in charge of the project, which included artificial lakes, bridges, caves and fake ancient temples, all following the Romantic trend of the time. Pedro II's children were also born in the palace, including Princess Isabel, famous for having abolished slavery from Brazil in 1888. After the Proclamation of the Republic in 1889, the Imperial family left the country and the palace and its surrounding gardens became empty. In 1891, the building was used by Brazilian politicians writing the first Republican Constitution of the country. 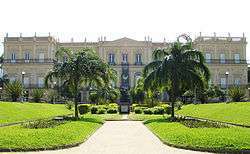 In 1892, the director of the National Museum of Rio de Janeiro managed to transfer the institution from the Campo de Santana to the palace. The inner decoration of the palace was dispersed, but part of it can still be found in other museums, like the Imperial Museum of Petrópolis, in which the Throne Room was reassembled. The palace during the reign of King John VI, 1817. The painting shows the palace before the construction of the tower to the left of the façade. Antique illustration of the palace, 19th century. The palace between 1835 and 1840. Daguerreotype of the palace in 1862. Ceiling detail before the restoration. Gates of the former main entrance. Former Imperial Palace; now National Museum. Lake and the palace in the background. Statue of Empress Leopoldina with her children Princess Maria (later Queen Maria II of Portugal) and Prince Pedro (later Emperor Pedro II of Brazil), in the palace garden. Monument to Emperor Pedro II in front of the palace. ↑ "Genealogia Fluminense - Cantagalo". www.genealogiabrasileira.com. Retrieved 2016-09-29.